The king of the jungle has had it up to his magnificent mane with the Internet’s obsession with his most tiny and, by his opinion, least adorable of cousins, the house cat! He watches all the videos and sees all the memes and has even watched all the reaction videos of people who “just can’t even” at how “cute” the little felines might be. He practically hurt himself rolling his eyes when he watched an eleven minute loop of “cats who can’t jump.” Oh, the agony and despair he feels as he sense his noble and respected state as the chief of the great cats slipping away. But, he’s come up with a tactic with the help of his most brainy of primate aides. “If you can’t beat them, join them!” (Well, admittedly, that was the second tactic. He had to be talked out of biting off the tails of every domesticate cat in the inhabited continents…) Fortunately for us all, Operation Lovable Lion is in full swing and the Jungle King has commanded all his most adorable lions to scour the world and earn lionkind their well-deserved squeeeees. 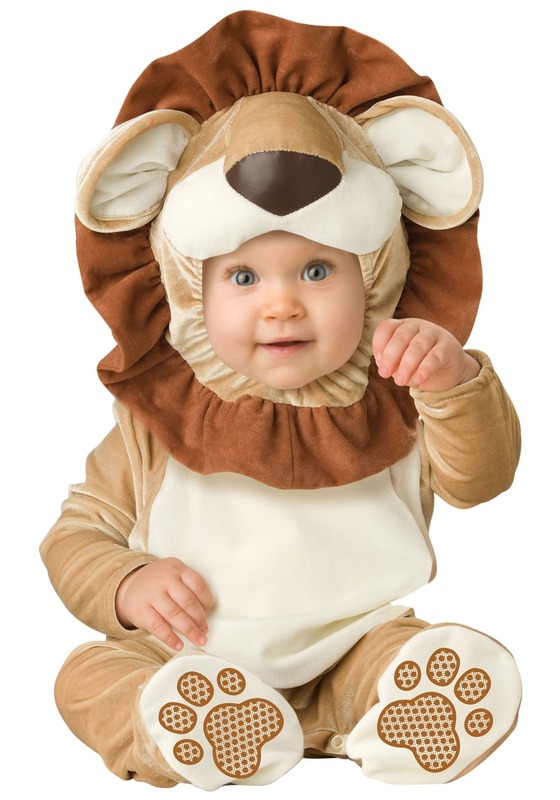 And, you and your little one can be among the parade of cute with this Infant Lovable Lion costume. A gold velour jumpsuit with white chest and brown arms and legs starts the image and the foot-print anti-slip booties will have your babe snuggled up and cuddly. But, the crowning moment comes when you pull up the hood and reveal the adorable lion mane, ears, and muzzle that will at least triple the already irresistible face of your little cub. It’s time to take down the kitties. Lion Pride!